Are your headlights blurry and the light has become really bad when you are driving in the dark? Older cars are using glass for the headlight, while newer cars use plastic material. The plastic material got a lot of scratches and other damages over the years, which make it blurry. In many cases, if the scratches are on the outside of the plastic, you can polish it away with a headlight restoration kit by yourself at home instead of replacing the whole headlight. Here is a list of the 5 best headlight restoration kits to buy in 2019. If you want to find more information about headlight restoration kits before buying one, check our buyer’s guide and information in the bottom of the article Here. First, on the list, you will find the 3M 39008. Why we placed this kit on the top of the list, is because it’s are a really good kit with a low price. You will find several different packages to choose from when you come to the product page. You can read through the different products to make your choice which kit will fit you the best. Overall you will get the most required parts in this kit to do a really good headlight restoration job. You will get an adapter to connect your cordless drill to the grids to make the job a lot faster and easier. However you can do it by hand also, but it is a lot more time-consuming. The negative thing with this kit is that it is not including masking tape and the polish may not be enough for two headlights. So if you think of polishing both headlights, my recommendation is to buy two packages if you are going to choose the 39008 kits. Depending on which package you choose, the kit we are talking about will include 3 grits of different sanding discs. You will find 500,800 and 3000 trizact disc. If you check out our headlight restoration in the bottom of the article, you will find out why you need so many different sanding grids. But a short summary is that the higher the number, the finer the sanding grid is and you should always start with the roughest grid and go down to the finest. There are options to choose from if you need a full complete headlight including a kit with the required professional machines also. No masking tape included(You get it if you choose the 39165 packages). Meguiar is our second product in this list. This is actually the best kit to buy in my opinion if you are going to do a headlight restoration. But the price is a bit higher than the other products and that’s why we placed it on the second place in this list. Meguiar’s is a very popular brand when it comes to creating awesome polishes, waxes and other car detail products. 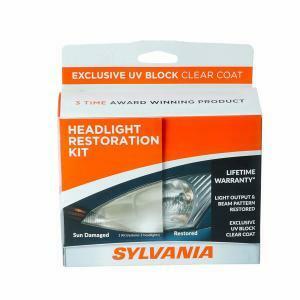 They are also continuing with this quality when it comes to the headlight restoration kit. When you come to the product page, you may realize that there are different products to choose from. If you want to do a complete headlight restoration with the absolute best results, I do recommend to pay a bit more to get the G3000 kit. The differences between the kits you can read on the website. When it comes to working on headlights, you should always be extra careful working with powered equipment as one wrong move could damage a seal or even scrap the car’s paint. Although powered tools get the job done quicker, if you aren’t too experienced with such tools, you are better to do the procedure with hands. You can choose yourself if you want to use this kit with a drill or if you want to do it by hand. Overall it’s a good and high-quality kit, with some minor drawbacks. The drawbacks that we found is that it would have had been nice if the kit included a few more wet and dry sandpapers to work with. Another minor drawback is that this kit also doesn’t include masking tape to cover the parts where the polish and sanding doesn’t go. So you’ll have to get a few sets of masking tapes to get the job done by creating a mess. Besides that, there isn’t much to it and Meguiar makes it for a good headlight restoration kit to have as for a low price you’ll be transforming your old looking headlights into new looking shiny headlights. 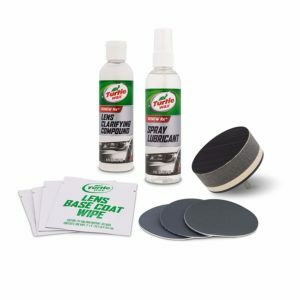 The Mothers headlight restoration kit is very popular among vehicle detailing enthusiasts due to their large variety of progressive sprucing products. 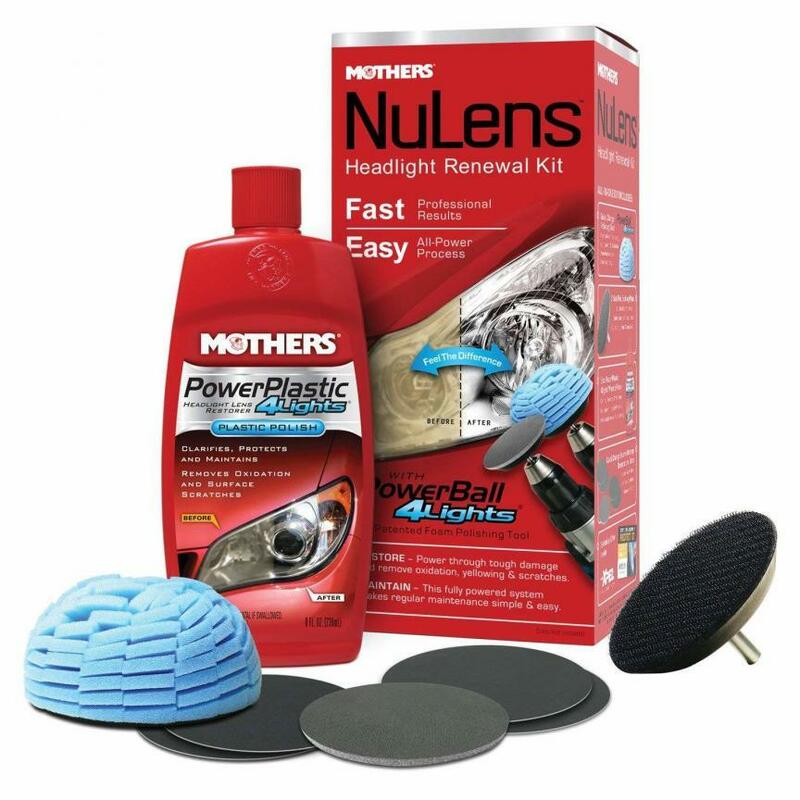 Mother’s has yet another good headlight kit like every other vehicle detailing equipment makers. In the kit, you will find the most required parts like sanding discs, a 3-inch backing plate (To connect the pads to a drill) and polish. The negative things we found about this kit is that it doesn’t include rough sandpaper and it can be difficult to fix badly hurt headlights without it. However, you can still fix them but it will take a longer time with fine paper. Another bad thing we found is that the kit is not including any headlight UV protection to apply to the headlight after the restoration is done. I do recommend to buy this separately and apply to the headlights if you choose this kit because without it you will make the lifetime of the restoration a lot shorter and you have to do the process very soon again. The kit is not either including masking tape. Enough of bad things, the good thing with this kit, that the kits mentioned above don’t contain, is a round Power Polishing Ball. The difference here is that it’s made up to look like a cone, and contains plenty of foam palms. The good thing about with this, it’s much easier to not risking burning the paint or other areas around the headlight when you are polishing the headlight. If you are polishing a lot of headlights, maybe you are using it at your work for customers cars, you can choose a package of 6 pieces for a really reasonable price at Amazon. What makes this kit a little different than the rest here is the fact that the brand Sylvania isn’t as popular but don’t get me wrong. Popular or not, this kit has been tried by us and it’s far better than many would think due to its status in the market. In this kit, finally some masking tape is included and you do not need a power drill to make efficient use of this kit. Although the tape included isn’t of the best quality, it gets the job done nonetheless. The included tape definitely doesn’t match the quality of that provided by 3M’s package with their masking tape. If you are lazy to sand by hand, you should consider other kits which include a power drill pad. Overall, this kit performs really good and the price is really reasonable. It’s not the cheapest kit available on the market, but nonetheless offers good products and good outcomes seen on the headlights after using it. The kit includes detailed instructions on how to use it with every tool you’ll require to use during the cleaning process. The variance of the grits is really good in my opinion. There is a great mix of 400,1000 and 2000 grit which can fix the worst headlights and are fine enough to do an easy job of headlights that are not the affected. Another great thing with this package is that you will get vinyl gloves with it, which is great because dried polish can be really hard to get away from your hands. Even harder to get away from your clothes, so you really do not want to polish in any clothes you do care about because most of the times you will get polish everywhere, especially if you are using a drill. Now we have come to the last product in this list, but do not judge it. Turtle Wax is a really known brand in the car detailing industry and known for creating high-performance products. They really do produce quality polishes and waxes and their interior polishing products are just amazing and get perfect results. In this kit, which includes the drill tool pad, you get 3 sanding discs of grit 1500, 2400 and 3600 and a bottle of cleaning compound. Also, 4 moist wipes are includes along with base coat wipes and finishing coat wipes as well. With these words, we know that this kit includes the products that the most other products in this list include and the price is really low. Turtle Wax says that you will polish one headlight in 15 minutes with this kit. Of course, that depends on you and if you are doing it by hand or using a drill. With this, I do also want to say that never hurry when you are doing a headlight restoration because you will most likely end up with bad results that disappoint you and you can even damage parts because of this. You do not really want to spend another 300$ to buy a new headlight because you didn’t take enough time for the job. To conclude with this one, even though last on the list, it isn’t the worst kit of them all. It may not remove deep scratches or completely clear your lights but that’s only because it lacks low grit papers which can be overcome by getting these sandpapers separately. 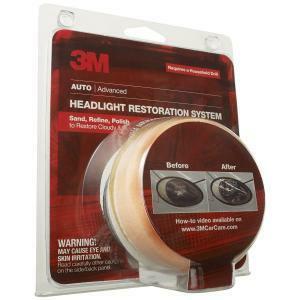 We believe that this kit is more suited for moderately damaged and yellowed headlights which aren’t too oxidized. That’s because the sanding discs included aren’t enough to fully eliminate the cloudiness and oxidation as well as the deep scratches. Product made by Turtle Wax. Polishing Pad not included, polishing is done by hand. Why do the headlights get blurry on newer cars, but not the old ones? The main reason for this to happen on newer cars, but not old is that older cars used glass on the headlights, which was more durable and it didn’t get scratches from bugs and other parts flying on the road. Newer cars use plastic headlight glass, which gets scratches and worn out and turn yellow over the time. It can be pretty difficult to notice that your headlights had turned blurry because this happens over time. But you will for sure notice a difference after the headlight restoration is done. Should I use a machine to polish them or do it by hand? This question has some split thoughts. Polish by hand will make the job quicker, but it’s a higher risk that you will damage the parts and the paint around the headlight if you are not careful. If you have a lot of time and want to do the job properly, my recommendation is to do it by hand. If you think you have the skills and want to do the job a lot faster, use a polish machine with the right pad to polish them. Do I have to mask the headlights with tape? Yes, you should always mask the area around the headlight with tape if you are not removing the headlights. On some cars, it’s pretty easy to remove the headlights and this will give you a better result and you won’t risk damaging the paint or other parts around the headlight. Remember to use a tape that won’t stick to the paint and leave marks. You can try the tape on another part first and let it sit for a while and then remove it to see if it will leave any marks. Some of these kits include tape to mask the headlights correctly. Should I polish my headlights myself or let a workshop do it for me? Polishing the headlights, require a bit of patience and nicety. If you feel that you do not have these two characteristics, I do recommend to leave it to a mechanic workshop. A headlight restoration does not often cost really much and you will most likely get a better result than doing it yourself if you are not sure. However, if you are a bit technical and have some patience to read instructions and do the job carefully, you can absolutely make the job with great results. This is a decision you have to make yourself. The best way is always to check the following instructions with the kit to be 100% sure. However here I will write some steps you should take when you are restoring your headlights. To make it easier for you is that I will first post a video of how to do it, and after that you will find the steps in text. Remember to follow the steps and instructions carefully and take your time to get a really good result. First, before you are doing anything, you have to clean the headlights carefully for any bugs or other crap that is stuck on the headlight. If you leave dirt there and start to sandpapering and polish, you may end up with even deeper scratches than you had before. After everything is cleaned, you should either mask the area around the headlight or if possible easily, remove the whole headlight for the best result. If you do not do this, you may end up with scratches or remove of the paint or other parts around the headlight. Now when everything is cleaned and you have masked or removed the headlights, it’s time to start with rubbing it with a rough sandpaper to get away the deepest scratches. My recommendation is to start with a 100-200 Wet sandpaper if the headlight is scratched really bad. If the headlights are not that bad scratched, you can start with a 300-800 paper. Remember to use a wet sandpaper and use a lot of water when rubbing it. Now we get to the next step, rub it with a 300-800 wet sandpaper to equalize the scratches that were made by the 100-200 paper. Rub it until you feel that it is enough and then you can go to the next step. Now your headlight will look like a mess and something that will never get fixed again, but do not worry. Everything should be right. Continue with rubbing the headlight with a 800-1500 sandpaper. You can actually start off with 800 and go down to 1500 slowly if you have the patience and want the best results. This is the last step of the sandpapering. Rub the whole headlight carefully with the 2000 wet sandpaper. You can use even lower sandpaper if you want to get the best results, but 2000 should be okay for the most people. After all these sandpapering steps, there is now time to clean off the headlight with a tower and let it stand to dry up. It’s important to let it dry up enough to not polish on a wet surface. You can now apply the polish from the headlight restoration kit to the headlight with an even surface around the whole. Now you can start to polish the headlight either by hand or with a machine. It’s important to keep circular movements and never polish for too long at the same place, as it may burn the headlight and you have to start over from the beginning or you may need to buy a new headlight. Check some videos of how to do it properly if you are not sure. Now the fun parts of this process come. It’s now time to rub off the polish with a towel to see the results. If you can still see some small scratches, you may have to polish it with the polish a bit more and if you see deep scratches, you may have to rub it more with the sandpaper. This process requires a bit of feeling to know which step to take. If you are satisfied with the result, you can either leave it there or add wax on the headlight to protect it from further damages and scratches. My recommendation is to always add wax after you have made a headlight restoring to keep the results for a long time. There are also other products made for this purpose instead of wax. If you see some scratches left on the inside of the headlight, there is really not much to get it away. You can remove the plastic and polish the inside of the headlight, but it’s often an advanced process to get there and often easier to buy new headlights if it disturbs you. There are a lot of things that you should consider before making your purchase of the headlight restoration kit. You do really not buy a bad headlight restoration kit that may even damage your headlights with permanent damages. You should always check the part list of the including parts with the product. Read if you need a polish machine or that you will get pads that you can polish with by hand. In the most cases, you can also use pads for machines and rub it with your hands, but it will take a lot more time and it’s better to be safe than sorry. Make sure that you get all kind of sandpaper between 200-2000~ in the kit for a good result. Considering the price of the headlight restoration kit can be a good thing to do before your purchase. Often you will get what you pay for. If the headlight kit is really cheap, you do really have to double check why it’s so cheap. Check that all the necessary parts are following with the package. 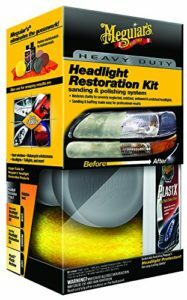 My recommendation is to spend a bit more on a good headlight restoration kit to get good parts which will help you to get a really good result in your headlight restoration. By checking for the recent reviews on Amazon, you can see what previous buyer’s think of the product. On Amazon, you will find thousands of honest reviews from real customers that have tried the product. My recommendation is to get a kit with over 4.5 stars rating if you want an as good product as possible. You can also research a bit through Youtube and check if you can find any good reviews about the product. Restoring your headlights is a really time-consuming work if you want to get good results. If you are hurrying through the process, you will most likely just end up with a wrecked headlight or the parts around it, and that may end up with that you have to get a new headlight for thousands of dollars on some cars. My recommendation is to take the steps slowly and read the instructions carefully. Another good tip is to check Youtube videos of how to restore your headlights. So what are our conclusion out of this? The most products in this list are pretty similar and you will get what you buy – A package of the most necessary tools that you need to restore your headlights instead of replacing them. You may not get the perfect results the first times that you are doing this, but practice will get you results. A lot of people are not even knowing that you can restore the headlights instead of replacing them, so you may even start your own business of polishing headlights after you have read this article. The price a mechanic or car detailer is taking for a headlight restoring is often kinda high, and if you have tried to do it yourself, you will realize that it doesn’t take that long to do it yourself. However, if you are going to buy a kit and do want the absolutely best results, we do recommend you to buy the meguair’s kit. If you do not want to spend that much money on a kit, go for the 1M kit instead. Now we are really interesting about how your headlight restoration went, if you have done it we would love you to write a review in the comments of how you did it and what product you used. We would love to hear your own review of these products down under!